Trying to get a head start on your extended essay? DP graduate Stephanie Stan, from Bloomfield Hills High School, USA, offers her advice on how to make the extended essay transform from just an assignment to a project that expands upon your own knowledge of a topic. The extended essay, a Diploma Programme (DP) candidates’ 4,000-word culmination of independent research and writing, is often framed by students as a dreadful experience. But the extended essay does not have to be “dreadful”. For me, the key to making the extended essay research and writing process intriguing, impactful and an incredibly enlightening experience was selecting a topic that I am passionate about. Choosing the topic of your essay might sound like a miniscule part of the writing process, but your topic (and how much you enjoy it) will make or break both your essay and your experience with it. DP candidates often have the misconception that the extended essay subject area must coincide with one of their higher level (HL) or standard level (SL) courses. But, this is not true! I highly recommend selecting a subject area that interests you (especially if it is a subject area that you are not studying) and in which you can select a topic that you are interested in. I cannot stress enough how important it is to dedicate time into considering your passions and channeling them into selecting a topic that you are excited to learn more about. This will make the extended essay writing process very rewarding and one that you will learn from. 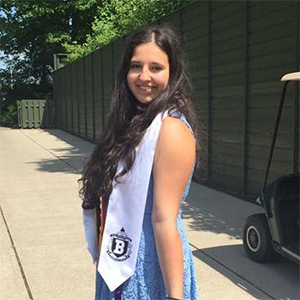 Stephanie Stan is a graduate of Bloomfield Hills High School currently studying at the University of Michigan. I speak from personal experience, as the only person in my cohort who seemingly loved writing the extended essay. Why was this? I switched my topic at the start of the research process because I realized my first topic was not something I was passionate about and I was having trouble motivating myself to research. I needed a topic that fueled the desire to expand my knowledge. I love history and art; both are passions I hold on the sidelines of learning about medicine. I took time to reflect on what I was interested in and what I would love to learn about outside of class. This led to a new and final topic — I centered my essay around the question of how treatment of degenerate art affected Adolf Hitler’s power in the Nazi regime. I had learned about this time-period in my DP history SL class, but we did not cover censorship and the control of visual arts culture. My desire to expand my knowledge in this subject area motivated my research and writing. Once I changed my topic, the difference in my approach to the extended essay was instantly noticeable. Instead of feeling like I had to go research my topic, I wanted to continuously find more resources and information. My advice? Select a topic that you are interested in and want to learn more about and that you may otherwise never be exposed to. Choosing a topic that interests you will have an immense impact not only on your extended essay but also on yourself. I spent hours of my summer in a nearby college library and online databases researching. I was truly interested in learning more about the subject. What at first seemed like a tedious assignment became a personal project of exploration and growth. It allowed me to get carried away with the research for my essay, compiling over 30 pages of research findings. My new topic made me love writing my extended essay. Take advantage of this incredible opportunity for personal growth and intellectual expansion; not many high school students can say that they could self-select and direct research on an individually proposed topic for almost (if not more than) half a year. You will thank yourself and reflect positively on the experience! If you pick a topic you love, then researching, planning and writing your extended essay will not feel like an assignment; instead, it will become a self-motivated exploration and adventure that will help you grow as a student and an individual. Mindset is important: Do not think of the extended essay as an assignment; think of it as a self-proposed goal and opportunity. Have fun with it! Your dedication and enjoyment will shine through your writing! Start your extended essay early: Give yourself time to think about your topic, plan, research and begin the writing process with less stress— give yourself time to enjoy it without being overwhelmed. Pace your research: Establish a timeline with mini-goals to achieve. This will help you organize your research and make incremental progress (time management). Create planning diagrams: Color code your research and quotes to organize your findings and map everything to its correlated section within your essay. Stephanie Stan is a current pre-health student at the University of Michigan studying towards a B.S. in Biology, Health and Society. She joins us this year as a 2018 alumni contributor to share her experience as a DP graduate. To learn about the IB alumni network, visit ibo.org/alumni and read about our 50th anniversary featured graduates to see where other students have taken their studies and careers.